This company’s stock has soared while the rest of the semiconductor space tanked. What’s Xilinx’s secret? Check out the latest Xilinx earnings call transcript. As many may have observed, the semiconductor space sold off hard over the past six months. The simmering trade dispute with China, combined with fears of slowing global growth, has put the sustainability of the past few years' tech boom in question. 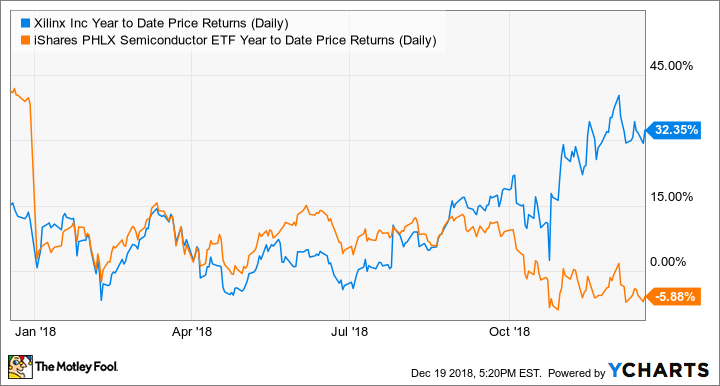 Unlike software stocks that have recurring revenues thought to be somewhat immune from downturns, semiconductor businesses are often thought of like industrials, which are heavily tied to the business cycle. And yet programmable chipmaker Xilinx (NASDAQ:XLNX) has defied the recent semi swoon. The stock is up a whopping 30% on the year as of this writing, while the semiconductor sector has fallen deep into negative territory. XLNX Year to Date Price Returns (Daily) data by YCharts. So what is Xilinx doing right, and should you add the chipmaker to your portfolio? Xilinx makes programmable logic devices (PLDs) that help route workloads between processors and memory on integrated chips. Unlike custom chips, PLDs can be programmed by customers via software to fit their specific applications. This is in contrast to application-specific integrated chips (ASICs) and application-specific standard products (ASSPs). In general, PLDs are more flexible and offer faster time-to-market, with much less upfront investment. ASICs, on the other hand, typically offer higher performance in smaller form factors, but have high upfront costs and little to no flexibility in how they're used. One of the reasons for optimism around Xilinx is that PLDs could start to take a larger share from ASICs and ASSPs in the future. As PLDs become smaller and technology improves, the PLDs could potentially become more attractive relative to ASICS. Furthermore, the upfront costs of designing one's own ASIC is rising as technology challenges become harder. Like the move to heavier use of open-source software vs. customized (and expensive) proprietary software, PLDs have come more into fashion versus custom chips due to their agility and relatively low upfront costs. Improving quality of PLDs is also making them more competitive with ASICs on high-volume applications. A quick glance at Xilinx's financials might make you wonder why the market is so bullish. The company trades at an expensive-looking P/E multiple of 38 and that drops to 26 when using earnings estimates. While last quarter's growth of 18.9% was quite good, a valuation that high would tend to forecast even stronger growth, or the sustainability of a mid-to-high-teens growth rate over a long period. The answer, I think, lies in the growth of Xilinx's newest "advanced" products -- namely, its new Ultrascale+ family of products introduced over the past few years, especially the Zync Ultrascale model. These advanced products are quickly catching on, and displacing the use of Xilinx's older core products. Data source: Xilinx FY Q2 2019 press release. YOY = year over year. As you can see, advanced products are grew at a staggering 43% clip in the most recent quarter, far outpacing the overall company growth. Advanced products now make up about two-thirds of Xilinx's revenue, as opposed to just about half the mix one year ago. As that higher-growth segment makes up more and more of the business, Xilinx's growth should maintain its high levels, and even potentially accelerate. Finally, the market is forward-looking, which means new products and opportunities are also boosting Xilinx. One exciting new product is the company's 7nm Versal ACAP (adaptive compute acceleration platform). This new product will not just be software-programmable like Xilinx's previous chips, but can also be altered at the hardware level. The company just announced the Versal ACAP product last quarter, which management called "the most profound recent milestone by far ... this is a new product category that goes far beyond the capabilities of [field programmable gate arrays]." In addition to new products, Xilinx also inked some impressive wins with major customers recently. At the end of October Xilinx won a big contract from cloud giant Microsoft over Xilinx's main competitor, Altera, which was purchased by Intel in 2015. New customer wins like these and new products like the ACAP are likely to keep investor enthusiasm for Xilinx high versus competitors -- barring a recession, of course. As cloud computing and 5G come online over the next view years, the PLD market, and Xilinx specifically, should benefit strongly. Xilinx seems to be winning this sector at the moment, and could be a strong pick over the next few years as exciting new tech applications for PLDs come online.